The whale watching industry in Tenerife is one of the most highly regulated in the world with a stringent code of practice on boat behaviour surrounding the whales. The waters off the SW coast of Tenerife are also one of the best places in the world, and without doubt the best place in Europe, to observe whales and dolphins all year around. Many of the boats will donate to the AWF a proportion of the ticket price if booked through this website so, if you want to make a difference why not book a trip online now!! ​Eden is a small, family run company that has been on the go since 2003.We pride ourselves with attention to detail and individuality towards eachof our customers. The staff on the boat are able to converse in many languages, and are fluent in English and Spanish. ​The Royal Delfin is ideal for everyone as you will have plenty of room to roam around the boat, whether you want to sunbathe or sit inside where there is air conditioning. As something new the Royal Delfin also offers direct "submarine" TV on board, where you can view the whales and dolphins from below the water. This authentic Arabic sailing boat is inclusive of drinks, food and swim. There are also a guide who will entertain you on this 5 hour trip. 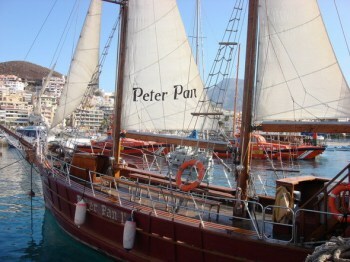 The Peter Pan boat is base in Los Cristianos harbour where we will go to visit the pilot whales and dolphins. Anchoring later in the marine reserve of La Caleta or Palm-Mar to enjoy a swim in the transparent waters and eat a hearty lunch. Since 2000, Mustcat offers two catamarans for tours and spotting of whale and dolphins colonies that inhabit the Atlantic, south of Tenerife.